Fishing the WooDream is a Dream! It was a crazy day yesterday. Fishing is what I enjoy the most. Hunting is a close second. Geoff and I went up to set up our Bear spot, but the snow was too deep! It is a little early to fish the private lake he has access to, but as a consolation to a ruined day, Geoff said, "Let's go give Gilbert Lake a try." I took the Tenyru Rayz Spectra and the Shimano Cardiff with 2.5 pound Sunline. I began fishing with various spoons and didn't even get a bump! Geoff was fly fishing, and wasn't catching anything either. After about a half hour Geoff finally caught a bass. I changed over to some of my less expensive plugs and again, nothing! I even pulled out some spinners that worked last spring - nothing. I told Geoff, I have a secret weapon from Japan. He said, "I think it is time you try your secret weapon!" So, out came my WooDream that I thought best imitated a baby sunfish. 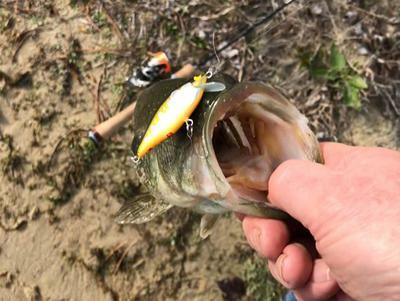 I realized I had never really "played" with this lure to see the action. I was fishing the WooDream Arbor 50SFlat. I loved the way it sinks. It doesn't have much side to side action at a slow retrieve. A jerk retrieve really brings it to life! Watching all of those Japanese videos was about to pay off. It had been a half hour of nothing, with the WooDream fished with a jerky retrieve, on the second cast a bass slammed it! Fishing was still slow, but the next half hour brought 4 fish my way. I had fished a WooDream Arbor 40S last fall up in Valley Creek and caught several nice rainbows and cutthroats. One of my fears is losing a $40.00 lure. I realized yesterday, that the value of my fun was worth way more than $40.00. The other side, it is difficult to think about losing such a beautiful lure! The third thing I realized yesterday is these Japanese lures are much more sophisticated than the regular plugs that we often fish. They go way beyond just a basic wiggle! I'm really looking forward to fishing these this summer for trout! 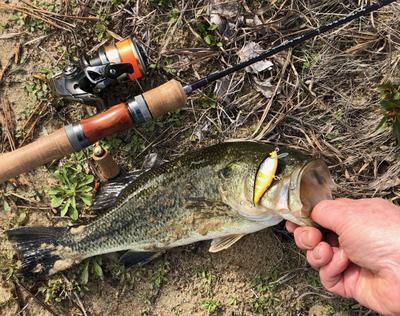 I would love to hear about others who are fishing their WooDreame lures. They are made for fishing! I have noticed Angler Saito fishes them too.